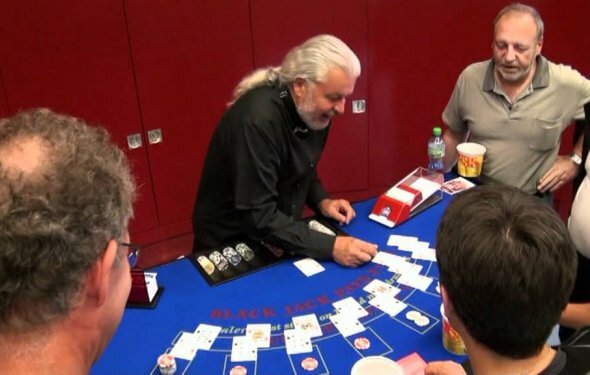 Why is there no longer an MIT blackjack team? This was related to me many years ago. As you might be aware the physics departments of MIT and U.C. Berkeley have a lot of cross pollination (now there's a lousy metaphor - sorry). Anyway, it was the late 60's or perhaps the early 70's that some Cal physics grad students and others, further up the feeding chain, got together to see of they could wire up a gadget to count the cards. I believe it was those eastern rascals that were leading those innocent California boys astray. They got the thing to work kinda sorta okay in the lab, but good enough that there were calls for field tests. Road trip to Reno! In the casino, these nerds were none too sly and the machine wasn't working as well as it had several hundred miles and numerous drinks before. They kept pulling it out and checking the wiring and fiddling with it. Total geekdom. Sure enough security soon made an appearance. Instead of throwing them out, they were taken out back and beaten with rubber hoses. Just kidding. In fact, They were taken in back someplace and the security guys, some casino techs and the physicists set about trying to make the thing work. It was explained to me that it was painfully obvious the casino security knew they were dealing with harmless nerds. Moreover the casino was interested in making it work so that they could then develop counter-measures. Lawrence Revere (born Griffith K. Owens) was an author, casino pit boss, and professional blackjack player best known for his book Playing Blackjack as a Business. Revere played under multiple aliases, including Leonard "Speck" Parsons and Paul Mann. Revere had a degree in Mathematics from the University of Nebraska.